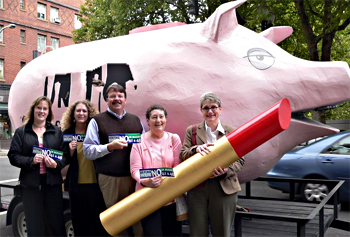 Meanwhile, outside the debate hall, members of the Oregon PTA and other supporters point out that no matter how much lipstick you try to put on TABOR, it's still a bad deal for Oregon. Here they are posing with the pig that Howie Rich has sent around the country to push TABOR in other states. McIntire's been staying close to the pig over the past few weeks, which explains why he's been a no-show at several high-profile ballot measure forums. Apparently, his New York boss thought McIntire is a better pig wrangler than debater. I have to say, after seeing him today, this is one time I agree with Rich. There's a picture that paints 1,000 words. The Oregon PTA stands up to Howie's $10 million pig. Very nice! LOL - Way to go Otto, Anita et al! This makes me even more proud to be a card-carrying member of the Oregon PTA. Three cheers for Otto & the Oregon PTA! You guys rock. The rest of the creatures in that picture would benefit from lipstick too. I haven't read the ballot measure yet, but knowing that Macintyre supports it is reason enough to vote Yes. If it weren't for Don, my outrageous $5,200 property tax bill would be $8,400. And the schools, jails, and roads would still be underfunded. But there would be plenty of money for Wi-Fi, biodiesel, choo-choos, and running big business out of town. Hey the photoshopping is fair play. Also cute and fun (in my book). However if the pig was not in the least bit effective then the purveyors of pork would be ignoring it. So... Go Patty (the pig) Go! I listened to the debate on OPB radio. It was very entertaining and impossible to miss the fact that, contrary to his upfront claims to the contrary, McIntire's arguments were absolutely eviscerated by Novick. McIntire did make one claim that drew blood, however. The Oregon legislature will never create a rainy day fund if left to their own devices. Which frankly is a huge black mark on the legislature. The simple fact of the matter is that they can't be trusted to operate in the best interests of Oregon, else we would have a rainy day fund already. Just because McIntire's assinine approach is a demonstrably bad one doesn't mean that there isn't a legit reason to force constraints on the legislature... as Kulongoski recognizes with his drive to create a rainy day fund. If McIntire really wanted a rainy day amendment he would have written a rainy day amendment. He didn't. The truth is there will never be an adequate rainy day fund without some kind of spending limit in place. Kulongoski's proposal is pie-in-the-sky. To build a rainy day fund equal to 10% of the general fund out of corporate kicker rebates would take over 25 years (longer if we actually had to dip into the fund). 2) look for a new dedicated revenue source. Did you notice how fast Kulo backed off his proposal to take the personal kicker? His staff knows the score. They also know that voters won't buy into a rainy-day-fund-tax (no matter what euphemism used to describe it). Time to face facts: politicians promising to fill a rainy day fund are today's equivalent of "40 acres and a mule". If the citizens don't pass a constitutional limit on spending growth, it will never happen. Actually, if he had written the rainy day provision in the amendment, it would have violated the rule that prohibits changing more than one thing in the constitution at a time. Therefore, it would have been struck down by the courts. He did the only thing he could do at this time. The fact is, like 48 or not, a rainy-day fund is needed and the legislature is far too gutless to institute one on their own. I've got a great spreadsheet that you can enter different rates of inflation, growth, and revenue growth and see how TABOR, 48, and the current system would play out. M48 actually provides the most stable budgeting and is comparable to the current budget in growth. The TABOR line is always significantly below both of the other two. I'll send it to anyone who emails me. You'll all mostly still vote no on 48, and that's fine, but at least you'll see the real impact and if you're interested in honest debate, you'll be informed. If you want to demagogue against (or for, for that matter) M48, the spreadsheet won't help. Don, I'll take you up on your offer. I'd really like to see the numbers. I am well aware of the single subject rule - which is why I said if a rainy day amendment was what he wanted he would have written one. Instead, he wrote a spending limit and called it a rainy day amendment, which it isn't. Silence Dogood, you're such rightwing whiner! Geesh,, this is no official photo used to erase history. It's a piece of political satire. Oops, I forgot that righties don't understand satire. If someone had wanted a rainy day fund they could have written a single subject rainy day fund measure. That isn't what they wanted, they are just using rainy day fund to hide their true intent. For those amused by the picture, be sure to read Steve Duin in the Sunday Oregonian. I bought the early edition and it is about how poor a debater McIntire is. Of course we need a rainy day fund, but a serious one. If someone doesn't like the idea of the corporate kicker for a rainy day fund, they are perfectly able to say "fund the rainy day fund with this specific source". But instead in recent years we've gotten lame Republican ideas like the bucket plan where money was supposed to slurp from one bucket to another to create a rainy day fund. The solution to that is to oust all those who thought the bucket plan was serious and replace them with legislators who will discuss details with the general public. Actually, Patty the Piggybank herself is the political satire, and it's a message getting LOTS of attention around the state. The image of a pig has two meanings - savings and spending. Oregon's state government spends too much and saves too little. And many of the readers of this blog will get it ... there is now more than one Patty on the scene. Making fun of a satire doesn't "git 'er done" without a willingness to put the object on full display. Not doing so shows cowardice and weakness of position. "A penny saved is a penny earned" ahs become "extreme" politics? It's obvious that SPEND Oregon has taken Oregon way "off track." Silence Dogood, Cowardice is bringing your pig to the Josephine County Democrats office when we're not around, taking a picture, and putting it on your blog implying that we're in favor of the measure. We're not, to imply otherwise is straight up dishonest. Your pig stinks.